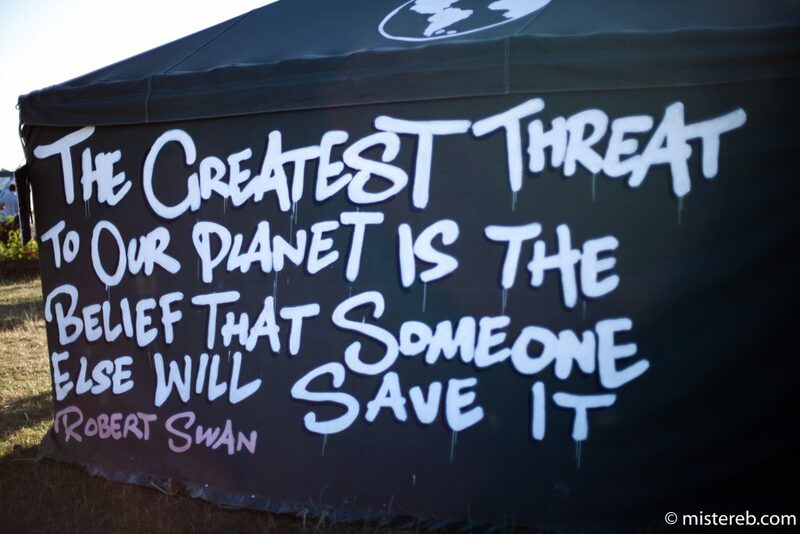 My facebook news wall this summer showed how big a problem rubbish is at festivals. Pictures of the litter field following Boomtown; my friends’ group selfie at Bestival, laughing, oblivious to the state of the field they are in, empty beer cans and coffee cups tickling their feet. This year, I decided to get more intimate with the recycling at The Green Gathering. It’s not something I’ve previously been keen to get up close with. A couple of years back, I remember waiting in the queue to get my festival wristband and being mystified that the woman in front of me announced with genuine enthusiasm that she was on the recycling crew. Who in their right mind wants to spend time at a festival tackling our addiction to disposable plastic and all the other stuff we thoughtlessly use and dispose of? “Probably the last job I’d sign up for – bless her,” I thought to myself. But we have to don’t we – get woke about our relationship to garbage? Who wasn’t depressed by Richard Attenborough’s report earlier this year: the image of a long-legged bird, standing, its body entirely vacuum packed in a plastic storage bag? 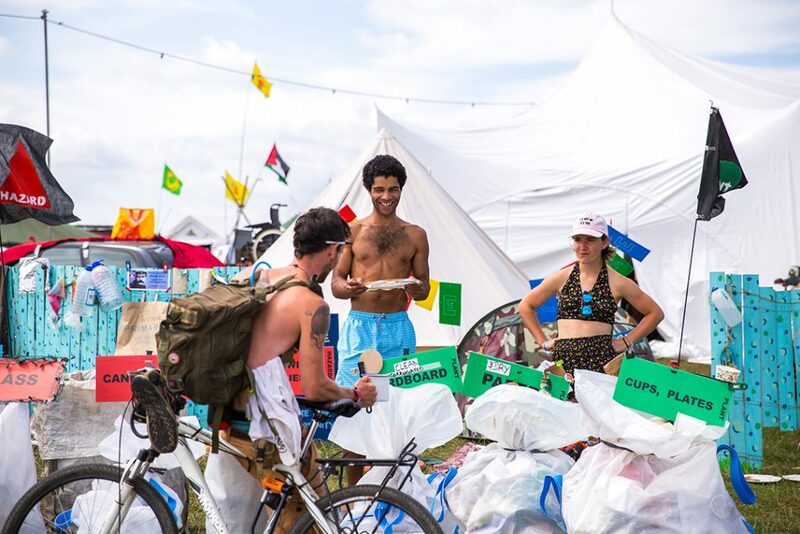 One of the most striking scenes for me at The Green Gathering – ‘a festival beyond hedonism with education for a sustainable future its focus’– is the tremendous energy that goes into separating the rubbish that accumulates over the four day festival. No other festival I know of sets such a task for itself. If you want to immerse yourself in the issues and see proactivity with heart, this is the place to be. The recyclers are a warm, close-knit crew, led predominantly by passionate women like Sandra and Lynn, who camp together under the trees near the crew canteen, creating their own community over the festival days. Several of the core team have been organising this festival amenity for 18 years, raising children, who, as young adults, are now stepping into roles of responsibility in the organisation. So here’s how it works: there are 14 recycling stations around the festival and 14 sacks at each station. The materials collected are: metal; glass; cardboard; paper; drink cans; food cans; dirty paper plates, cups and wooden utensils; food waste; nappies and wipes; plastic PET drink bottles; plastic trays; plastic HTPE milk bottles; plastic wrap; tetrapak cartons. I ask why we’re bothering to separate so finely when we know it can’t all be recycled – now that China doesn’t fancy taking our garbage off our hands, the UK is struggling to know what to do with all our waste. Indeed, depressing new stories over the festival period compounded the seeming futility: the woeful inadequacy of council recycling centres and their inability to process the mixtures of plastics produced hit the BBC news. For the recycling team, there are multiple reasons for insisting on the divisions. Separation means some materials can be sold. It reduces contamination of recyclable material which otherwise would render it good for nothing but incineration or landfill. The array of sacks, neatly organised and lined up with colourful signage, forces people to slow down and consider the complexity of the ‘rubbish’ they habitually throw away in haste. 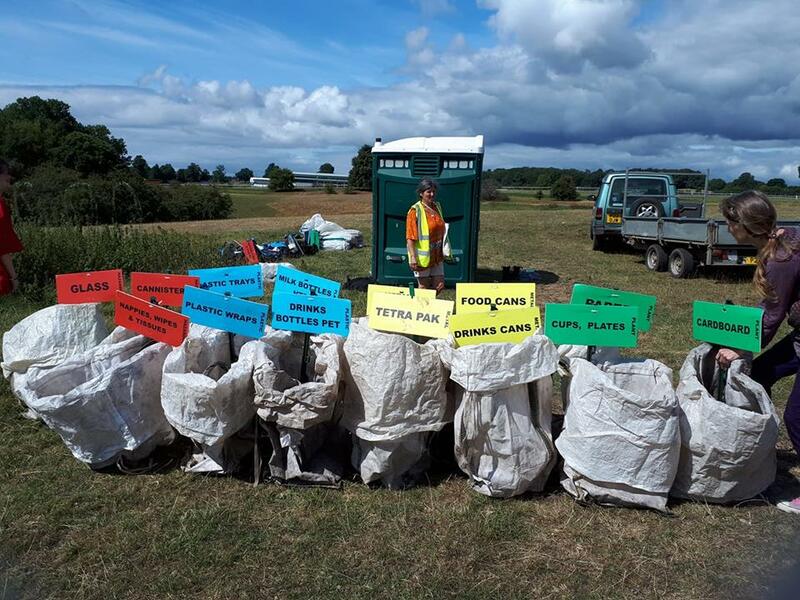 The separate sacks of compostable materials are delivered to Compost John, tasked with constructing the festival compost heap. I had to see this giant lasagne in the making and asked for directions. The days of the festival were swelteringly hot so I waited until late afternoon then, following the directions I was given, I discovered the hidden-away spot where the heap was under construction. ‘Compost John’ of York was standing by the already sizeable mound accumulated after a day and a half of the festival, chatting to two men about his methods and assembly. Piles of kitchen scraps from festival attendees and the cafés operating on site were organised on large deflated air mattresses. John explained that he’d rescued these punctured airbeds from the trash of previous festivals and was using them to further separate and sort the compostables provided by the recycling crew. John gestured enthusiastically to neat piles of foodstuff; boxes and other cardboard; paper serveware; branches and brash. 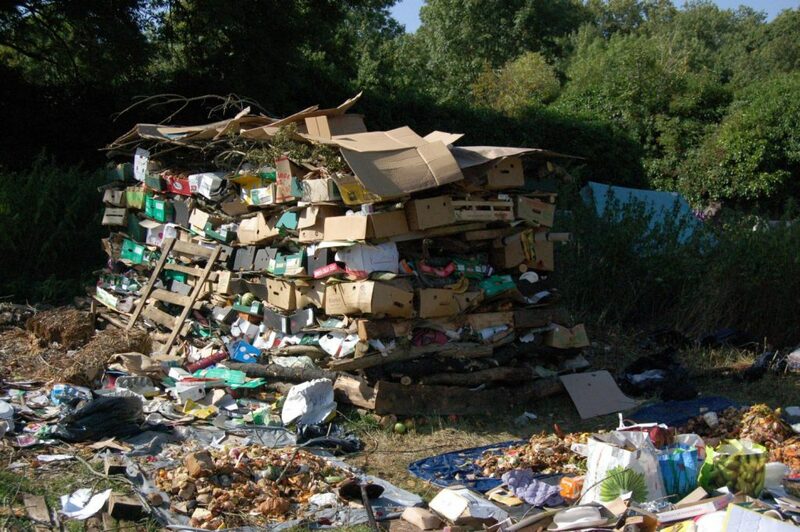 Intact cardboard boxes were being filled with scraps and stacked in layers, supported by a rectangular armature of branches. The heap was growing rapidly. By the time I left the festival on Monday, it was taller than I and still gaining height; John was using a ladder. I would have liked to see the compost heap change and collapse over the coming weeks and months. I asked John whether this giant edifice would be a vermin magnet? “What do you call vermin?” he asked me quizzically. “I only see creatures of the countryside.” “Ok rats” I said solemnly. People are often hung up on this issue and cite it as a reason not to collect compost. John admitted rats could be having their own festival for a short while, but there would be a time limit too for their partying; soon the heat created by the decomposing materials in the heap would make it unpalatable for them and even for the flies. In addition to the massive effort made to recycle festival revellers’ rubbish, The Green Gathering encourages people not to create waste at all. The eateries on site have to provide compostable paper plates and cups and wooden utensils for their takeaways if they want to use disposable serveware and beyond this, they’re encouraged to provide real crockery; festival goers are encouraged to ‘Bring Your Own Mug’ as well as a reuseable water bottle; and there’s a ‘Crock n Rock’ stall, run by the educational charity arm of The Green Gathering, which enables people to dine on real crockery AND have it washed up for them afterwards for a returnable deposit of £1. The Green Gathering has an additional recycling ‘Resource’ zone overseen by another dedicated woman, Sara. The zone has even more recycling sacks and stacks than the other stations, and signage provides information on how much different ‘waste’ materials are worth in the recyclables market. Flags indicating the contents of each sack are flown from recycled tent poles. (Such ingenious pieces of kit with their metal tubes and elastic. How terrible so many get landfilled at other events rather than challenging our creativity to find new uses for them). The Resource zone provides equipment to clean items for reuse. 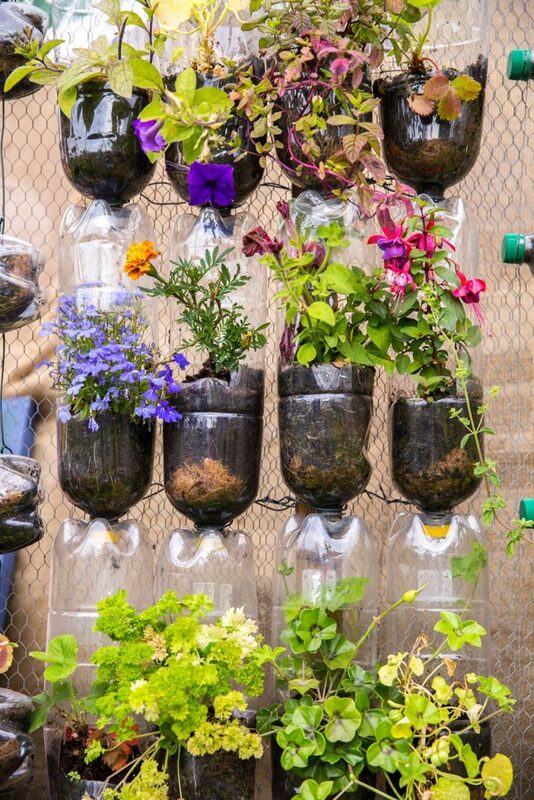 This involves an ingenious washing station, called a Tip-Tap, made from recycled tent poles, string and two repurposed plastic bottles. Operating one crushed bottle as a foot pump, the user can control the velocity of a stream of water pouring from a small hole punched in the second bottle. Daily workshops in Tip-Tap construction were popular and these Heath Robinson style contraptions appeared around the festival site wherever campers or crew fancied an extra washing station. There was plenty of interest in cleaned items for reuse. Wooden forks and spoons from takeaways are handy (I still have mine, which I keep in my handbag and have used on several occasions for a meal on the run). Clean plastic bottles for refilling were coveted by dehydrated revellers who’d forgotten or lost their own. The more I looked, the more I marvelled at the complexity of man-made materials, their shapes and qualities, and how absurd it is to squander them thoughtlessly after just a single use. Under a hot sun, Sara was there all hours of the day, gently helping slightly defensive recycling newbies through the complexity of sorting their waste. I understood how they felt. This is Deep Recycling. I deliberately took Arthur, the six-year-old son of a friend, to chat with Sara; counterbalancing his innocence and curiosity with my own embarrassed ignorance. Arthur and I explored the zone together, taking our time to investigate the separate sacks. Our favourites were the ones for metal waste, subdivided between magnetic and non-magnetic. We had fun testing metals with the giant magnet supplied. Bottle tops?.. magnetic. Food cans?.. magnetic. Drink cans?.. non-magnetic. Two girls of a similar age to Arthur were chattering excitedly about their recent purchase from a hawker at the festival’s ‘Flypitch Alley’. Their purchases were very popular with the kids this year: large metal springs which roll and expand over the arm like a bracelet making a pleasing vortex shape. Admiring them, I was already thinking about how these trinkets would one day be binned or, perhaps, recycled. We decided to test them for magnetism and found they weren’t magnetic. They reminded me of the ‘slinky’ of my childhood, a coiled metal spiral often found in birthday party goody bags. No doubt there are millions of tangled 1970’s slinkys rusting in landfill sites today. Recently, I went to another festival. There was a well-meaning art installation: a geodesic dome, decorated with plastic flowers and with a female figure standing in front of it. Eight real flowers in pots of earth circled around the outside of the dome. The work seemed to vaguely reference environmental concerns about the use of plastic, the dome representing the earth, the mannequin a goddess/mother earth figure. At the end of the festival, I saw a woman, who I assumed was the artist, take apart the installation. She tidied up the different components except for the real flowers, which were still in bloom. These she dumped into one of the standard, non-separating, hold-all type rubbish bins. To experience the steadfast commitment of The Green Gathering recycling spaces and the people who shape them is to experience aesthetic practice in action. Wouldn’t it be great if all UK festivals could make ‘deep’ recycling a standard of festival culture?